Mitsubishi redesigned the Outlander Sport for 2011, but can it go toe-to-toe against the more established sport ute – the Nissan Rogue? Watch the video as Ryan and Aaron take these city crossovers deep into the forest on a holiday challenge and drive over some real terrain more challenging than a urban street riddled with potholes. The small Nissan Rogue SUV is compact, pleasant, and competitive in the small SUV class. The 2011 Rogue is now offered in two trim levels, S and SV, along with the sporty Rogue S Krom™ Edition. Built on the Nissan “C” platform, which provides high body stiffness, the Rogue is a front engine, front-wheel-drive vehicle with optional all-wheel drive. The standard 4-wheel independent suspension gives a balance of ride comfort and driving stability and all Rogues come standard with power-assisted front and rear vented disc brakes with ABS, Electronic Brake Force Distribution and Brake Assist. The Nissan Rogue has a MSRP starting price of $20,810. The 2011 Mitsubishi Outlander Sport is a stylish and roomy 5-person compact crossover vehicle (CUV) that achieves an impressive 31 mpg highway and sports high-tech amenities including a Sportronic ® continuously-variable transmission (CVT) and an available 40GB HDD navigation system featuring real-time traffic and storage for up to 3,000 songs. Standard features include steering wheel-mounted audio and cruise controls, LED taillights and Mitsubishi’s innovative FUSE Hands-free Link SystemTM with USB input that allows users to make hands-free phone calls or access music on their iPod® with simple voice-commands. Eco-friendly equipment including electric power steering (EPS) and a brake energy regeneration system and safety features including 7 airbags, Hill Start Assist (HSA) and Active Stability Control (ASC) are all standard. The Outlander Sport has a MSRP starting price of only $18,495. Content is copyright 2003-2010 Driving Sports. All rights reserved. @Steve — What is an RVR? Aaron is driving an Outlander Sport. 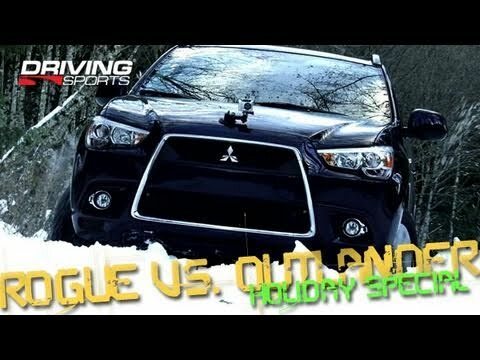 CarReview recently tested the Outlander Sport and the crossover in the video looks just like the car we reviewed. I would just like to point out that your comparison is wrong, the one driver is not driving an outlander he is driving an RVR. good job guys.